Meet Goofus. Like most dogs, Goofus’ life started out pretty well. As a puppy, he was given as a birthday gift to an 8 year old boy 14 years ago. At first, he was allowed in the house to play, live and be a part of the family...his new ‘pack’. But soon, like all pups, Goofus grew and became a ‘teenage’ dog and the owners felt that he would be ‘happier’ outside. 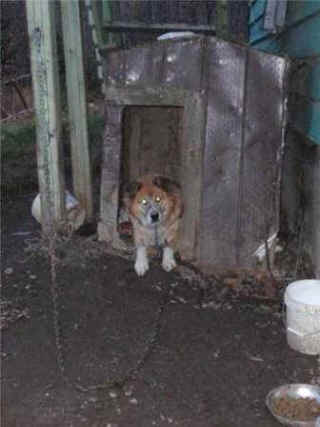 At first, he was only chained when no one was home. Other times and during the night, he was left to roam and soon found himself in trouble with the community. That’s when Goofus’ life went drastically wrong. Left unneutered, unvetted and unexercised, Goofus lived 24 hours, 7 days a week, 360 days a year on the end of a twelve foot chain. The once happy puppy became surly and aggressive. He would bark all day and once in a while would break off his collar in desperation, only to have his collar replaced with a choke chain which tightened around his neck with the weight of his chain. Goofus spent the next decade living in his own filth and covered in mud and feces. He endured years of extreme cold, heat spells in the summer and endless insect bites from fleas and mosquitoes. The weeks turned to months and the months to years. 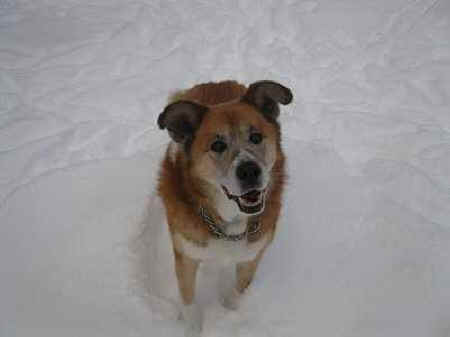 Goofus now was an old dog...half blind, half deaf, and in pain with arthritis. He had lost control of his bowel and bladder and even his doghouse was full of his own filth. Then, in October ’09, something special happened to Goofus. His plight was discovered by a Dogs Deserve Better representative. The rep talked to the owner, and over time, convinced them to surrender Goofus to Dogs Deserve Better. In late December, right before Christmas, Goofus was finally liberated from his ‘owner’ and brought to Terrace and into a loving foster home. A wonderful woman here in Terrace brought Goofus into her home, cleaned him up, gave him a warm bed, and with Terrace Dogs Deserve Better’s help, provided him veterinary care for the first time in his 14 years. Just last week, a wonderful forever home was found for Goofus in the lower mainland with a very special lady who will give Goofus all the joy and comfort he can squeeze into his remaining years. And, we can only hope that those moments in his new home, loved and cared for, are his only memories and that his horrible past will be forgotten. Dogs Deserve Better is an advocacy group dedicated to freeing the chained dog and bringing him into the home and family. You can help chain-ge lives. Donations to Terrace Dogs Deserve Better can be made at Kermodei Veterinary Hospital in Terrace and by contacting us directly. We are grateful for your support in helping local animals in crisis. For help or more information, please contact Terrace Dogs Deserve Better by email and visit the Dogs Deserve Better.